Blood Tonifier & Circulator Herb Tea is made of wild carthemus, white peony root (paeoniae radix) and woolly grass (Imperata cylindrica). They provide carthamin, paeoniflorin, asparagine, cylindrin, etc. Chinese medicine uses them to tonify the blood and facilitate blood circulation and defense. 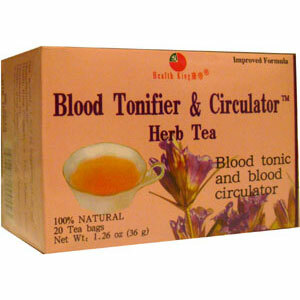 Tonify the blood and facilitate blood circulation and defense. Steep in hot water for 3-5 minutes for hot tea. Steep in hot water and refrigerate for iced tea. For maximum benefit, use 3-4 teabags a day. For maintenance, use 1-2 teabags a day. Reuse each bag until the water is colorless. Do not reuse teabags from the previous day.